Is a fortress built by the Crusaders in the early 13th century on a small island connected to the mainland by a causeway. A climb to the top leads to the roof where there is a good view of the port and the old part of the city. Today the castle consists primarily of two towers connected by a wall. In the outer walls Roman columns were used as horizontal reinforcements, a feature often seen in fortifications built on or near former Roman sites. The west tower is the better preserved of the two. Old prints of the fortress show it to be one of great beauty, but little remains of the embellishments that once decorated its ramparts. 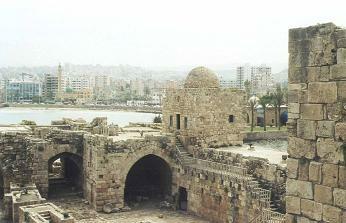 After the fall of Acre to the Mamlukes all the sea castles were destroyed to prevent the Crusaders from re-establishing footholds on the coast.